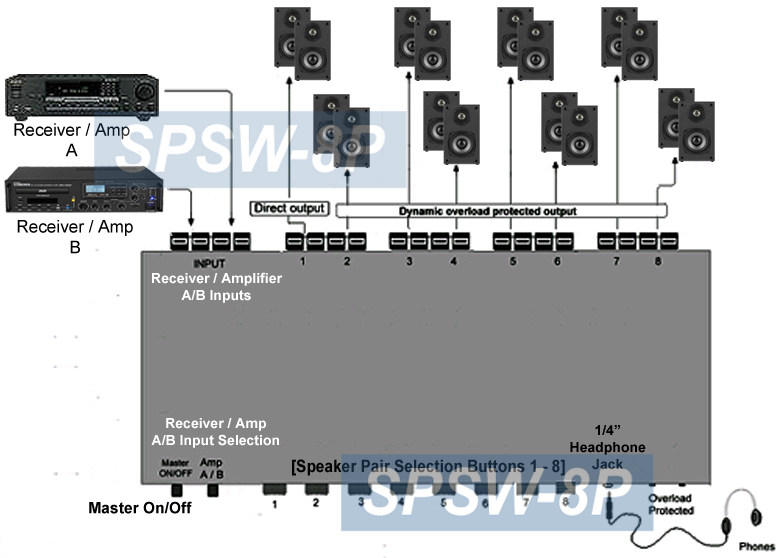 This multi-zone stereo speaker distribution system is an advanced audio distribution controller, allowing one amplifier or receiver to drive 8 speaker pairs at the same time for broadcasting music to all different areas. This speaker distribution controller system can accommodate two different stereo input signals and send either one to corresponding zones with great acoustical precision. It allows users to distribute the music signal from single amplifiers/receiver among 8 pairs of speakers and one headphone connected. 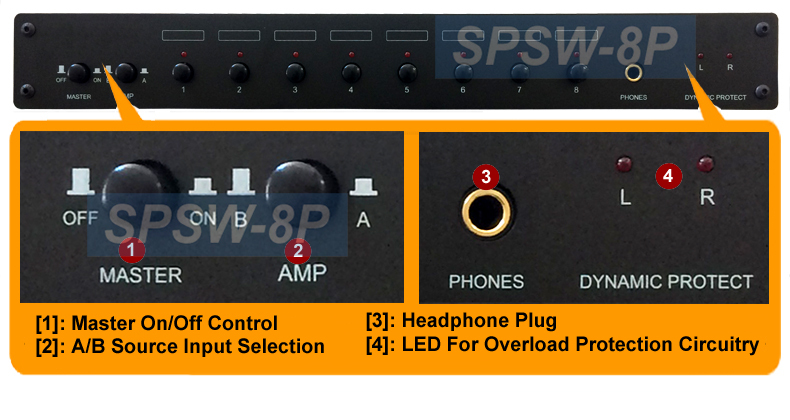 Users can easily control which speaker pair to be used for performance from one of the two amp/receivers connected using the push buttons on the front panel. This system also provides advanced protection circuit to ensure safe load for the amplifiers without the risk of damaging the amplifiers or speakers. Enjoy multi-zone music anywhere in the house while protecting your amplifier from damage and maximizing the performance of your entire music system. This unit can accept two inputs from stereo amplifiers/receivers and distribute the Hi-Fi stereo sound through maximum 8 pairs of speakers and one headphone without the risk of damaging the amplifiers or speakers. This unit is featured with convenient snap push terminals that accept up to 12 AWG speaker wire. This switch is featured with fully automatic and continuous 2-way protection circuitry with two dynamic protect LED lights on the front panel of this switch. These two LED lights are constantly blinking, which indicates that the built-in PTC protection circuitry starts the overload protection function. Premium 8-zone stereo speaker distribution controller to drive up to 8 pairs of speakers from amplifier or receiver. Easily expand the speaker capacity for the existing receiver or amplifier to handle more pairs of speakers. Select and play audio on any speaker pair, multiple pairs or all 8 pairs of speakers for performance. One headphone port for private listening or volume/signal monitoring purpose. Dual audio Input A/B switch for users to decide which input source to be played from through the speaker pairs selected. Independent On/Off switch for each speaker zone. Sonically transparent passive switching elements provide unsurpassed clarity. Front panel LED indicators for speaker pairs selected. 100W power handling per channel. Independent left and right channel ground paths . Snap-in push terminals for input interconnect. Power rating: 100 watts per channel. Need speaker wire to RCA phono terminal adapters for your amp or receiver, click here to order them !